Police are installing video surveillance cameras around homes undergoing renovations in Forest Hills and asking property owners to reorient any private cameras to give more street coverage as investigators press the hunt for a serial arsonist, officials said Tuesday. The NYPD plan to put up the cameras was revealed at a meeting Tuesday between city and state officials and members of the Bukharian Jewish community where seven arson fires have damaged 13 buildings, including a number of large scale homes undergoing renovations, since Oct. 20. In addition, the reward leading to the arrest and capture of whoever set the fires was raised from $12,500 to $62,500 with the addition of funds contributed by the Bukharian community, said people who attended the closed-door meeting but didn’t want to be identified. A spokesman for the NYPD said police had been installing permanent cameras in the vicinity. The fires damaged homes under renovation that included planned grandiose structures of the kind Bukharian immigrants had before coming here from the former Soviet Union in the 1990s, said Democratic City Council member Karen Koslowitz, who attended the meeting and represents Forest Hills. She said there are at least three homes undergoing renovations left unscathed by the fires. 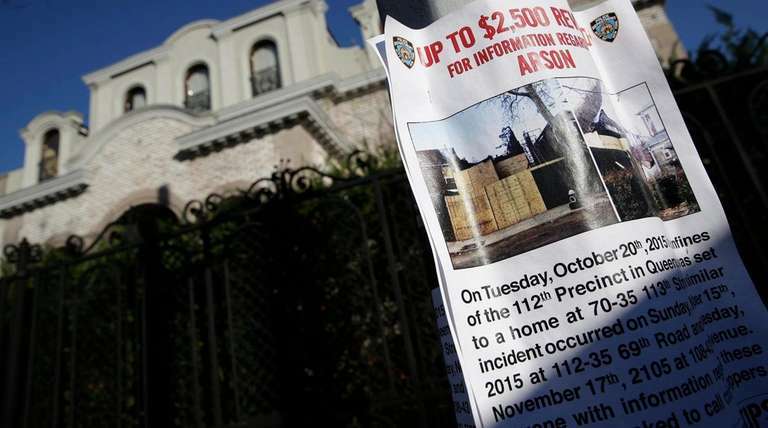 Those homes are getting extra attention from the police and the community, Koslowitz said. “It is just a pity, the people work very hard,” she said of the Bukharian immigrants. While the property owners impacted have been Jewish and the NYPD hate crimes unit is investigating, police have not determined whether the arson fires are bias crimes or the work of a person or people unhappy with the ornate architectural style of the structures, Koslowitz said. One law enforcement source said it is likely the arsonist is someone who lives in the Forest Hills area. Police do have a surveillance image of a man in a hoodie seen walking within the property line of one of the buildings before it was damaged by fire on Nov. 25 at a 67th Drive address. After the Sunday fire, the NYPD released a photo of a man on a motorcycle whom investigators identified as a person of interest. But NYPD Commissioner William Bratton said Monday the man had been identified and was cleared of any involvement in the fire.